There’s no slowing down the pace of commercial drone innovation. 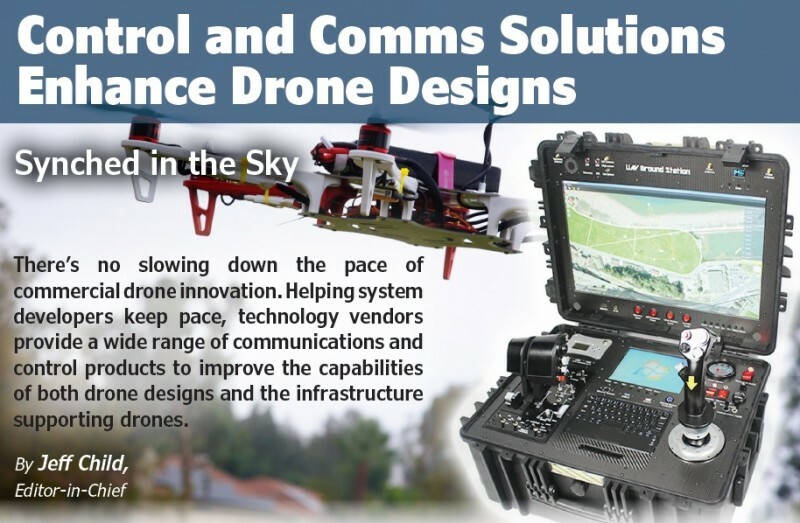 Helping system developers keep pace, technology vendors provide a wide range of communications and control products to improve the capabilities of both drone designs and the infrastructure supporting drones. Commercial drones continue be among the most dynamic segments of embedded system design today. The sophistication of commercial/civilian drone technologies are advancing faster than most people could have imagined just a few years ago. Feeding those needs, chip, module and software vendors of all sizes have been creating new solutions to help drone system developers create new drone products and get to market quickly. While drone technology encompasses several areas—from processing to video to power—here we’re focusing on communication and control solutions for drone system designs. Commercial drones rely on advanced wireless communications technologies for both control and for streaming captured video from drone-based cameras. Meanwhile, a variety of solutions have emerged for aspects of drone control, such as autonomous flight management and IoT-style integration of drones into powerful IoT networks. Datalink modules are an important technology for drone communication. It’s a tricky mix to be able to provide long-range communication with a drone, and still keep it to a small solution that’s easy to embed on a commercial drone. With just that in mind, Airborne Innovations offers its Picoradio OEM, the company’s latest miniature OEM product based on the pDDL (Digital Data Link) from Microhard Systems. The board is a full-featured pico-miniature advanced datalink module geared at demanding miniature long range drone applications (Figure 1). The Picoradio OEM board is a full-featured pico-miniature advanced datalink module geared for demanding miniature, long-range drone applications. With the Picoradio advanced single link system, you can perform three functions in one: HD video capable data rates, autopilot command/control and manual control with the company’s add-on SBUS passthrough module. Delivering a high-power, long-range broadband COFDM link, the board provides a variety of features in a tiny 17.6 g board that measures 40 mm × 40 mm × 10 mm. Picoradio OEM’s 1 W COFDM RF output has a typical range of 5 miles with very basic antennas—much longer range is possible using high gain antennas, RF amplifiers, tracking antennas and so on. Output power is software selectable from 7 dBm to 30 dBm in 1 dBm steps. The dual Ethernet ports can be used as Ethernet bridge ports or separate LAN segments. Two transparent serial ports are provided—one is switchable RS-232/3.3V TTL, one is TTL only. The board features wide input range efficient buck-boost operation. Inputs of 8 V to 58 V is supported at full output power, and 5 V to 58 V with limitations. Auxiliary power output is 12 V at 2 A typical or up to 12 V at 5 A (with input voltage limitations). These specs make it capable of powering cameras, gimbals and so on from wide input range battery power. Power-over-Ethernet (PoE) is possible using separate power and data lines. According to the company, the first revision of this board was highly successful and functional. The new version uses the 2.4 GHz unlicensed band at up to 1 W RF output. This is not a Wi-Fi radio, but rather uses a superior Coded Orthogonal Frequency Division Multiplexing (COFDM) modulation which is optimized for drone use. The default version has no encryption, and it can be exported outside the US. 128-bit encryption is available for some customers but has export restrictions. 256-bit encryption is available to domestic users. 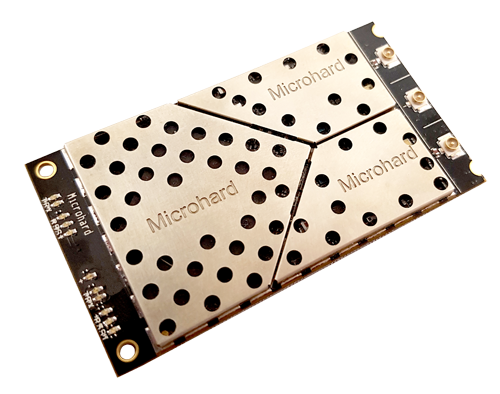 Aside from the one used in Airborne Innovations’ board, Microhard Systems offers a variety of DDL solutions. Among its newest of these products is its pMDDL5824 module, a dual-frequency 5.8 GHz and 2.4 GHz MIMO(2X2) digital data link. The module is a miniature OEM, high power, 2X2 MIMO wireless OEM solution (Figure 2). This dual- frequency solution allows software selectable operation in the 2.4 GHz or 5 GHz frequency bands. The DDL uses maximal ratio combining (MRC), maximal likelihood (ML) decoding and low-density parity check (LDPC) to achieve robust RF performance. 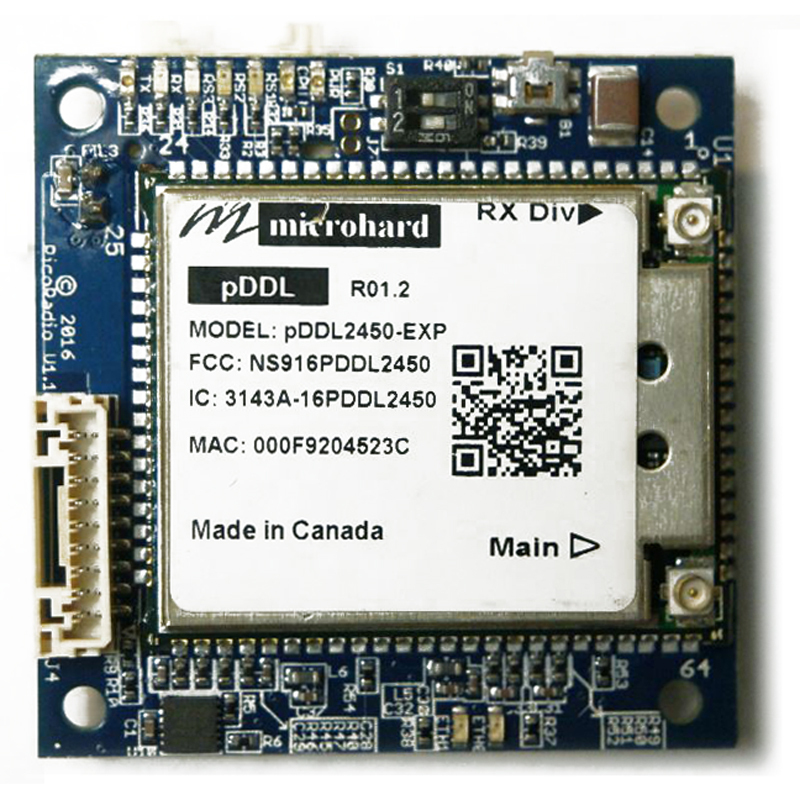 The pMDDL5824 module is a dual- frequency 5.8 GHz and 2.4 GHz MIMO(2X2) digital data link in a miniature, wireless OEM module solution. According to the company, the miniature, lightweight and robust design allows the pMDDL5824 to be well suited for size sensitive applications like commercial drones. The high-speed, long-range capabilities of the pMDDL5824 allow for high-quality wireless video and telemetry communications. The device provides up to 25 Mbps IPERF throughput at 8 MHz channel (-78 dBm) and up to 2 Mbps IPERF throughput at 8 MHz channel ( -102 dBm). It provides dual 10/100 Ethernet Ports (LAN/WAN) and supports point-to-point, point-to-multipoint and mesh (future) networks. It has Master, Remote and Relay operating modes and an adjustable total transmit power (up to 1 W). Interfacing to the unit can be done through local console, telnet and by web browser. It goes without saying that one the most common forms of data that drones need to transmit is video captured by the drone. The company Amimon has solutions to provide here. 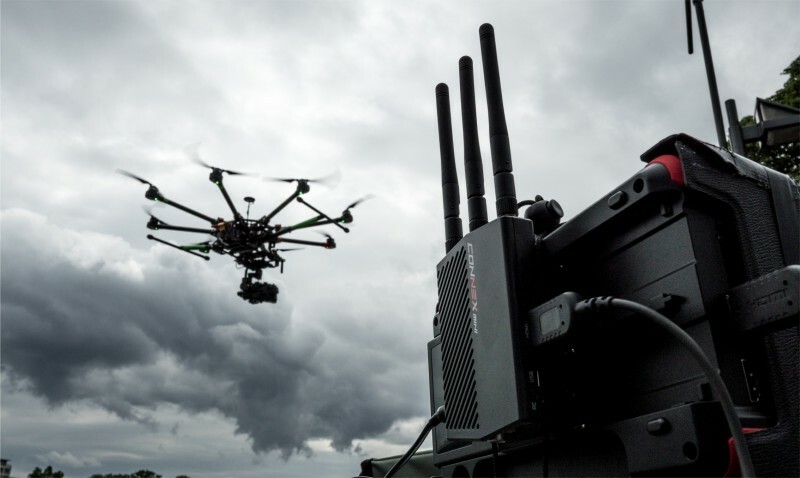 As a developer and provider of ICs and complete solutions for the wireless High-Definition audio-video market, they target markets beyond just drones, but its technology is very well suited for drones. According to the company, its video modem solution utilizes both MIMO and OFDM technologies, combined with Joint Source Channel Coding (JSCC) capability to transmit Full-HD 1080p60 video resolution over a bandwidth of 40 MHz or 20 MHz. Amimon’s latest 3rd generation baseband ICs allow for the delivery of 4K wireless video in high quality, while still maintaining zero latency (<1 ms) capabilities. The multiple inputs and multiple outputs, or MIMO, is the term used for multiple antennas at both the transmitter and receiver to improve communication bandwidth and performance. MIMO technology offers a significant increase in data throughput and link robustness without additional bandwidth or increased transmit power. It achieves this by spreading the same total transmit power over the antennas to achieve an array gain that improves the spectral efficiency—more bits per second per hertz of bandwidth—or to achieve a diversity gain that improves the link reliability (reduced fading). Because of these properties, MIMO is an important part of modern wireless communication standards, such as 4G, 3GPP Long Term Evolution (LTE) and WiMAX. Traditional wireless video compression systems use source-channel separation method, which leads to modular system design allowing independent optimization of source and channel coders. For its part, Amimon uses Joint-Source-Channel-Coding or JSCC approach. This approach enables a far better utilization of the channel capacity and handles better channel interference. Traditional systems transmit packetized information at a rate that is below the worst-case channel capacity to avoid high bit error rate (BER) and frequent retry operations. The traditional communication methods using H.264 or H.265 compression are prone to errors and thus uses buffering to ensure retransition of data when the BER exceed a certain level. They also use error correction overhead equality applied to all the transmitted bits unrelated to their visual importance. The use of JSCC eliminates these limitations. Amimon’s CONNEX product line includes a variety of wireless link products. Shown here is CONNEX Mini. Amimon productizes its video modem technology in several ways, including its CONNEX line of wireless video modems for the drone market (Figure 3). Its embedded solution is called CONNEX Embedded, designed to enable drome system designers to embed a wireless HD link into their systems with simple integration effort. The CONNEX Embedded provides a small-size, low-weight transmitter that can reach varied ranges and can be configured based on application needs. The unit is available in different configurations enabling uncompressed HD video with zero delay, Data Down/Uplink for control, standard HDMI output interfaces, SDK for controlling the link parameters and software management tools for users and operators. Just as the computing inside drones has grown more sophisticated, so too have the methods used to remote control commercial drones. An example along those lines is the Pilot app made by DroneSense. Pilot lets users control their drone using a tablet. Users can download ground control station software directly onto a tablet and then plug the tablet into the drone remote and begin flying manually, or pre-plan autonomous flights for an upcoming mission. Users can use Pliot’s autonomous flight planning functions to create a low-altitude orbit or undertake 2D/3D mapping (Figure 4). The can fly the drone fly manually to achieve a variety of tactical objectives, all while having a complete view of telemetry, video feeds and other relevant flight data. The app’s mapping engine enables drone pilots to clearly visualize all drones collaborating in an operation, helping to prevent redundancies or collisions. They can use chat functionality to enhance communications. It lets users view multiple live video feeds of various types, including thermal. The Pilot app lets users control their drone using a tablet. Users can use the app’s autonomous flight planning functions to create a low-altitude orbit or undertake 2D/3D mapping. Another feature of Pilot is that it is drone agnostic. Users can train once on the Pilot app, and use it on whatever drone is best-suited to each mission. Whether it is a fixed-wing or a quadcopter, the pilot interface remains the same—no additional training is required for different types or brands of drones. Users can just pick the drone and sensor required to accomplish their goals and fly. No hardware configuration required. 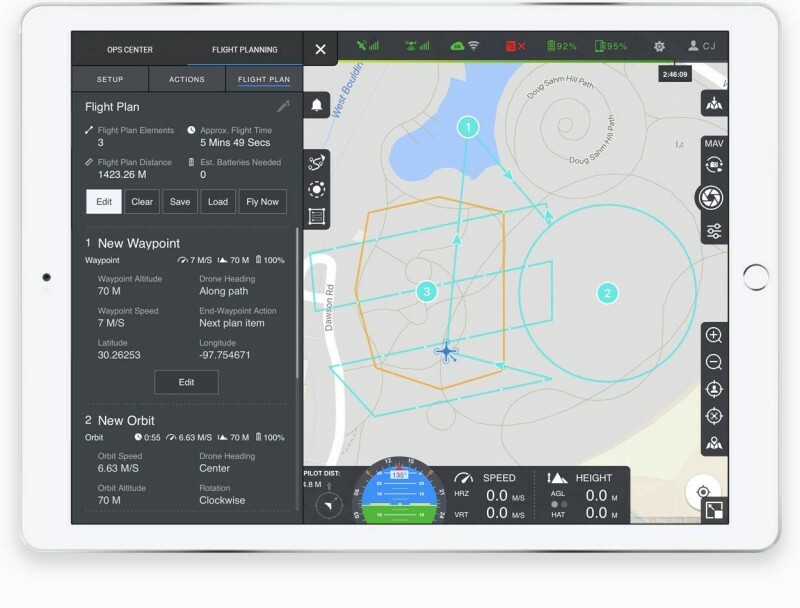 Users of the Pilot app can upload customized checklists from DroneSense’s AirBase software into the Pilot app, ensuring pilots follow established pre-flight procedures. Users can create and implement post-flight checklists, such as proper handling of any captured media. It allows you to enforce compliance with user policies and procedures, thereby minimizing risk and making sure assets are always handled properly. The Pilot app lets users bring in feeds from various sensor packages, such as a thermal imager, and see the output directly in the app. They can collect and view the data in the Pilot app (and DroneSense’s OpsCenter) from numerous sources for even greater situational awareness. The app’s flexible architecture allows for integration with third-party systems that may exist in a user’s organization. In many ways a commercial drone can be thought of as an IoT device. IoT implementations are comprised of edge devices with sensors, a cloud infrastructure and some sort of network or gateway linkng the edge with the cloud. SlantRange, a specialist in remote sensing and analytics systems for agriculture, made just such a drone-IoT connection in October with a new partnership with Microsoft. The deal combines Microsoft’s latest IoT connectivity and cloud analytics with SlantRange’s edge-computing capabilities into an integrated product offering for implementation developers operating large-scale drone programs in agriculture. SlantRange has patented technologies for aerial crop inspections and introduced analytical methods that deliver valuable agronomic data within minutes of collection, anywhere in the world, using low-power edge-computing devices. Microsoft’s Azure IoT Edge is a fully managed service that delivers cloud intelligence locally by deploying and running artificial intelligence (AI), Azure services and custom logic directly on cross-platform IoT devices. Through the addition of Azure IoT Edge, SlantRange’s platform provides a secure, scalable and fully integrated solution to deploy new cloud computing capabilities on top of SlantRange’s existing edge-computing architecture. SlantRange’s current products can do data analytics conducted completely offline, without the need for an Internet connection. Through the addition of Azure IoT Edge, the new platform provides a secure, scalable and fully integrated solution to deploy new cloud-computing capabilities on top of SlantRange’s existing edge-computing architecture (Figure 5). Their edge-based solutions can now be complimented by cloud-based services to seamlessly ingest, manage and analyze data from large networks of distributed sensors. Custom analytics as well as automated machine learning and artificial intelligence algorithms can be deployed both in the cloud and at the edge to create new data insights for a variety of stakeholders within an agriculture enterprise. The giant chip manufacturer Qualcomm has a foothold in the drone market on both the developer side and the end product side. For drone control, the company offers its Qualcomm Navigator software development kit (SDK). Qualcomm Navigator is an autonomous, vision-supported flight controller SDK with related modules and tools. It features multiple different flight modes with varying levels of sophistication, it is engineered to provide stable and aggressive flight for a host of applications. It includes several built-in sensor calibration procedures as well as automatic flight logging and real-time introspection tools along with post-processing, log parsing capabilities. The SDK supports various flight modes, from manual (for expert pilots) to assisted modes (for novice pilots). The tool fuses the machine vision SDK’s VISLAM for stable flight and DFS for visual obstacle avoidance. Meanwhile, Wi-Fi-based flight control can be done using the drone controller app. The SDK enables C API’s to get telemetry and control the flight path. Navigator is comprised of multiple libraries, executables and configuration files. The core flight controller runs on the aDSP, and other components run on the applications processor and GPU. Navigator provides a low-level C API for applications to interact with the flight controller. Supported interactions include accessing telemetry data such as battery voltage, status of sensors and current flight mode. It also supports sending remote control (RC)-style or velocity-style commands to the flight controller. With Navigator you can also send RPM or PWM commands directly to the ESCs and initiate sensor calibration procedures. Most of the leading microcontroller vendors market their technologies toward drone designs in some way or another. Among the more direct of these efforts is from Infineon Technologies, offering development kits and design resources. The company provides a complete system solution that includes all essential semiconductors for drones. These Infineon products include its AURIX and XMC controllers, its iMotion motor controller, its IMU (inertial measurement units) and its XENSIV sensors line that includes pressure, radar, magnetic sensors and more. This complete multicopter XMC4500 demoboard is built around an Infineon XMC4500 Arm CortexM4 32-bit MCU. IR2301 drivers, low-voltage MOSFETs and the MPU9250 Invensense IMU provide the additional units that make up the drone’s electronic powertrain, motor control and flight sensing functional blocks. 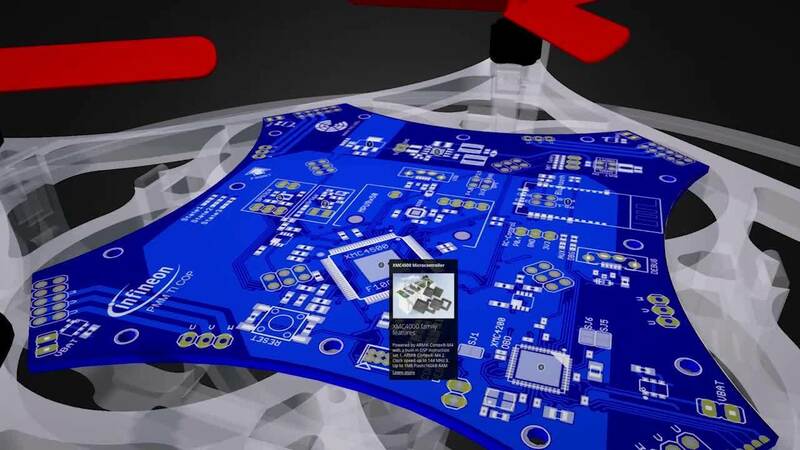 Among Infineon’s drone design offerings is a complete multicopter XMC4500 demoboard (Figure 6). At the heart of the board is the flight controller, which is built around an Infineon XMC4500 Arm CortexM4 32-bit MCU. IR2301 drivers, low-voltage MOSFETs and the MPU9250 Invensense IMU provide the additional units that make up the electronic powertrain, motor control and flight sensing functional blocks. There’s no doubt that today’s quad-copter- style commercial drones wouldn’t be possible without today’s high levels of chip integration. But even as developers push for more autonomous operations and AI aboard drones, they will also be need to send and receive control and video data to and from drones. Embedded control and communication technologies will continue to play a major role is these efforts. Later this year, in July, Circuit Cellar will take a closer look at the video and embedded camera sides of drone system design. 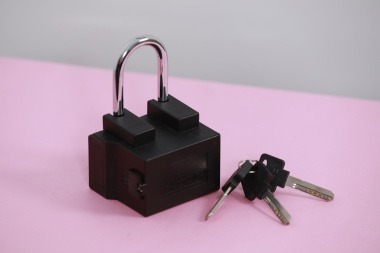 U‑blox has announced their collaboration with India‑based Play Inc. on a connected GPS padlock for industrial applications. The lock, which doubles as a location tracker, features a U‑blox M8 GNSS receiver, MAX‑M8Q, and uses the u‑blox CellLocate service to extend positioning to indoor locations. U‑blox Bluetooth low energy with NINA‑B112, and 2G, 3G and 4G U‑blox cellular communication modules, including some that are ATEX certified, enable communication between users and the lock. According to the company, In many industrial settings, locks are an unwelcome bottleneck. They typically require the physical presence of a person with a key to open them, they need to be checked periodically for signs of tampering, and when they are forced open, owners typically find out too late. Play Inc’s i‑Lock combines physical toughness and wireless technology to address these challenges. Offering a variety of access methods, including physical keys and keyless approaches using remote GPRS and SMS passwords as well as Bluetooth low energy or cloud‑based communication via mobile device apps, the i‑Lock lets plant managers or other customers flexibly grant authorization to access the goods that are under lock. And in the event that the padlock is forcefully opened, they are immediately alerted via a server or, optionally, SMS texting. In addition to securing mobile and stationary goods, the lock’s GNSS receiver lets users track goods in transit. The i‑Lock supports a variety of tracking modes to optimize power consumption for increased autonomy. Location‑awareness further enables geofence restricted applications, in which the i‑Lock can only be open if it is within predefined geographical bounds—for example a petroleum filling station. The security lock was designed to endure both physical attempts of tampering and cyberattacks. Its fiberglass reinforced enclosure withstands temperatures from -20 to +80 degrees C. The lock features Super Admin, Admin, and User access levels, 128-bit AES encryption, user‑configurable passwords, and a secure protocol to ensure data‑transmission accuracy. The TOBY-L1 series is u-blox’s latest line of ultra-compact long-term evolution (LTE) modules. The TOBY-L100 and its European version, the TOBY-L110, are suitable for tablets, mobile routers, set-top boxes, and high-speed machine-to-machine (M2M) applications (e.g., digital signage, mobile health, and security systems). Compared with multi-mode modules, LTE-only modules offer cost advantages. Therefore, the TOBY-L1 works well in networks with advanced LTE deployment applications. The LTE modules are available in two versions: the TOBY-L100 for the US (bands 4 and 13 for Verizon) and the TOBY-L110 for Europe (bands 3, 7, and 20 for EU operators). Contained in a compact 152-pin LGA module, the TOBY-L1 series is layout-compatible with u-blox’s SARA Global System for Mobile (GSM) and LISA Universal Mobile Telecommunications System/Code Division Multiple Access (UMTS/CDMA) module series to facilitate easy product migration and low-cost regional end-device adaptation. The TOBY-L1 modules are based on u-blox’s LTE protocol stack. The modules support smooth migration between 2G, 3G, and 4G technologies and feature small packaging and comprehensive support tools. The TOBY-L1 LGA modules measure 2.8 mm × 24.8 mm × 35.6 mm, which enables them to easily mount on any application board. The modules support USB 2.0 and firmware update over the air (FOTA) technology. The TOBY-L1 series delivers ultra-fast data rates and operates from –40°C to 85°C. USB drivers for Windows XP and 7 plus Radio Interface Layer (RIL) software for Android 4.0 and 4.2 are available free of charge.